Are you looking for an easier, more cost-effective way to promote your local business than print ads? Have you tried advertising on Google or Facebook and feel like you just threw away your money? In this article I’ll explain to you why Facebook Ads can work for local businesses, show you a great example of a real local business that has used them and how you can use them to drive new customers into your shop. The first place local businesses generally start when advertising online is with Google. For most businesses this is the best idea, but not for all. When people usually buy something locally and on a more regular basis, say groceries, dry cleaning services, or cosmetics, they’re probably not going to search online to buy those things. They just want to go to the nearest store to get them NOW. So to to drive in-store sales with online ads, you need to be able to both target the right people in your local area, and reach them somewhere that they’ll see it. The one website that allows you to do both of these things is Facebook. Facebook allows you to target your Ads as finitely as a single town or city. This makes it easy to only show your Ad to the people who will be able to walk or drive to your store. 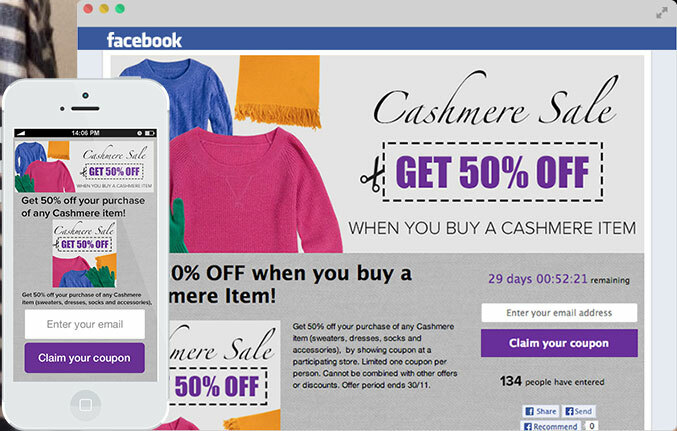 Using either a 3rd party Facebook coupon app, or Facebook’s Offers app, you can easily advertise your coupons and drive people to claim them on Facebook. Using Facebook’s Custom Audience targeting option, you can target people whose email address or phone number you have collected. And if you use any kind of loyalty program, then you will have this kind of information. Stine Home + Yard is a Louisiana-based home improvement store. Again, a product category that people don’t generally search for and buy on the internet. They just go to a nearby local store to shop. Stine spent a great deal on local print and TV ads in the past, and were looking for a way to more easily (and cheaply) promote special deals and events, and ultimately drive in-store sales. The company used Facebook Ads to promote seasonal sales and events such as “Labor Day Tax Free Weekend,” where digital marketing director Jeremy Stine features photos of customers with the sales sign, images from the company’s coupon book, and promotional videos. All of these targeted to people who live within 50 miles of their store in Louisiana. Jeremy also combined Ads with Facebook Offers to promote exclusive deals and contests for Stine Home + Yard’s Facebook community. Over a 12-month period in 2013, Stine grew their sales by over 10% and decreased advertising costs by 22%. Read the full success story on Facebook. The most effective way to drive new customer using Facebook Ads is to offer people something of value for free. Unlike Google Adwords, people aren’t actively searching for your products, so you can’t expect them to buy something from your Ad, even if they’re interested in it. Google Adwords are so powerful because you can show them to people who are interested in buying your products RIGHT NOW. With Facebook Ads, you don’t have that same intent to capitalize on. You don’t know what people are thinking about when they’re on Facebook (Spoiler Alert: It’s not you!). So you have to give them something to pique their interest - something that gives your audience value. I’m sure this product is great and easy to use, but I have ZERO interest in or need for DIY Steel Buildings right now. Heck, I live in an apartment in Downtown Vancouver. Instead of directly promoting a product or your business, you need to promote the value or benefit that I will receive by clicking on your Ad. Like I mentioned above, I’m probably not interested in buying your product right now. But if you choose the right target audience, you can easily offer me something of value related to your products or industry to capture me as a qualified lead for a future purchase. To attract clicks from people who are interested in DIY Steel Buildings, or have a problem that they can solve, futurebuildings.com could offer a free piece of content to get me to click and give up my contact information in exchange for it. For local businesses, Facebook provides the most important targeting option, which is the ability to target people in your direct geographical location. Second to that, you can also target people who are interested in your products, as well as match the age and gender necessary to use your products. An easier way to target is through Custom and Look-A-Like Audience targeting. Custom Audience targeting allows you to target specific people with Ads on Facebook. To do this, all you need to do is upload a list of email addresses to Facebook. Facebook will match them to their associated Facebook account and show those people your Ad. Look-A-Like Targeting allows you to target people who are similar to your current customers. This makes it easy for you to find new people to target, without spending hours tinkering with different targeting options. Similar to Custom Audience, you simply upload a list of your customer’s email addresses to Facebook. Facebook will match them to their associated Facebook account, and then find similar interests and demographic information between them. Then Facebook will find and target your Ad to other people who match this synthesized information set. As I iterated on above, Facebook Ads require you to provide an incentive to get people to click. They are most likely not thinking of buying something when they see your Ad on Facebook. So what is the best incentive to not only get people to click, but also get clicks from people who are truly interested in buying from you? And it doesn’t need to be something crazy like 75% Off. Something as small as 25% Off will generate a click from someone if it’s from a local business near them that they may buy from. The one number you need to focus on is your cost per conversion (which is Conversions/Spent on this table). This will tell you exactly how much you are spending to get one sales lead for your business. And as long as the value of one sales lead is higher than the amount you’re paying for it, then your Facebook Ads are profitable. And you can keep running them. If you’re like me, you’re never satisfied with your return on investment (ROI). You always want to find ways to tweak something to boost it. So how do you optimize your Facebook Ads to get the best ROI out of them? Test, test, test. Specifically, A/B test. A/B testing requires you to create multiple versions of your Ad to test against each other. In each variation you make only one variable of the Ad different. So if you’re A/B testing your Headline, use a different one in each variation, but leave the image and description of the Ad the same for both variations. This way, you will know for sure that it is the Headline that is causing the difference in the Ad’s conversion rate and nothing else. I recommend testing two Ad variations at once. This will make it as fast (and cheap) as possible to see which variation converts the best. You can do multivariate testing, which is testing more than two variations at once. But this requires more time and money for you to see which variation is the best. Headline: This is the bold, blue text at the top of your Facebook Ad. It’s the most important element of your Ad to convince people to click. It’s where people will make their decision to actually stop and click. The description text can help, but the majority of people will have already made their decision to click before they read it. Image: The image’s job is to get your Ad noticed. If you have a good image, it will draw people’s attention. Landing Page: While this is a can of worms in itself, I just need to mention it here because it is often forgotten in the Facebook Ad process. It’s the factor that will determine if people who click your Ad actually convert, buy or sign up. Even though a person claims your coupon, it doesn’t mean an automatic sale. A person may easily plan to use it later on and forget about it. So what do you do about it? You need to follow-up with that person to keep them interested in your business and push them to either make that first purchase with your coupon, or make repeat purchases after they’ve used it. This is done through automated “drip” email campaigns. This is a series of timed emails, which can easily be setup with Wishpond’s Email Marketing Automation Tool, that provide interesting content and purchase incentives to drive purchases over a number of weeks or months. After a person claims your coupon, send them an email immediately with the coupon itself, as well as a few items, or a recipe, they can purchase using the coupon. A few days later, send an email with three links to three different recipes, with a coupon to purchase the items needed in the recipe at a discounted price. Make sure each link is significantly different enough to get an understanding of that person’s taste in food/lifestyle. Based on which link the person clicked on, add them to a more targeted list, and send them weekly emails with new recipes, and coupons, for their specific tastes. This simple drip email campaign will keep this grocery store top-of-mind anytime their customers are going to shop, and will drive more purchases when customers receive recipes they want to try.